The long-awaited "Eurogroup" rescue package for Greece was finally agreed to in Brussels this morning and European equity markets promptly headed… lower (?!) in the wake of the news. The EU/ECB/IMF trio is into the Greek rescue by almost a half a trillion dollars at this point, and the latest life-preserver contains what is being labeled as a ‘significant contribution’ by the IMF. This was another, fairly typical display of "selling the news" and it prompted one Commerzbank strategist to wax poetic and remind that "sometimes it’s better to travel than to arrive." Others opined that the Eurogroup simply kicked the proverbial tin can down the road with this operation and that Greece’s odds of going belly-up debt-wise remain as good as ever. "the euro zone needs to acknowledge that there can be no solution to the euro crisis until the fate of its banking system is separated from that of its sovereigns. That will require the creation of pan-European deposit insurance and ultimately euro bonds to provide banks with an alternative risk-free asset. Unless this is what euro zone finance ministers have in mind as they sit down on Monday, they should have no business signing the deal. To go ahead with a flawed Greek bailout without a plan to accelerate euro-zone integration and create a functional monetary union would be an act of calculated cynicism that would simply deepen Greek — and European — agony." Now that the red wax seal is drying on the 130 billion euro package and the many strings that are attached to it, the markets can focus on the remaining troublesome items- banking sector problems and Greece’s own inability to avoid coming back to knock on the EU’s door for more assistance, at a later date. There appears to be little doubt that in order for the country to bring debt down to 120% of GDP such further help will be necessary. As things stand right now, if Greece is lucky, that ratio might get down to 129% by… 2020 or so. Marketwatch reports that "still, other analysts saw the central bank’s move as evidence of a more serious slowdown in China. The economy appeared to be decelerating following a winding down of the government-directed stimulus that helped shield the country from recession after the global collapse of 2008. Capital Economics analysts said Monday that January credit growth was "very weak," even allowing for distortions created by the Chinese New Year holiday." The Standard Bank commodities’ team however does note that "China’s platinum imports for 2012 were off to a weak start. The country imported only 149,000 ounces during the month. This is 94,660 ounces less than the import number in December and 87,800 ounces less than the amount imported in January 2011," and adds that "we believe that the Chinese customs data is consistent with our view that weak industrial demand will make it difficult for platinum and palladium to rally sustainably beyond $1,650 and $700 respectively. We also continue to look at platinum and palladium from a cost-push perspective, and believe that platinum and palladium below $1,500 and $600 respectively are too low." In any case, with this morning’s rally, the current discount of the noble metal to gold has now narrowed to about $70 from a previous near-$200 differential. Palladium was also a strong gainer this morning, rising $13 to the $710 level. Rhodium showed no change at $1,475 the ounce. In the background, the US dollar did not give up too much on the trade-weighted index, slipping only 0.02 to trade at 79.12, at last check. CFTC positioning reports covering the latest period indicate that gold has experienced a net decline in speculative length and that, according to Standard Bank (SA) analysis, such a contraction "affirms the view that the aggressive moves at the end of January were largely the result of over excitement after the Fed’s dovish [rate policy] announcement." A similar scaling back of speculative optimism was noted in silver- the ETFs turned into net sellers and unloaded 106.2 tonnes of the white metal in the process. The Standard Bank team notes that uncertainties remain manifest among gold and silver speculators despite the recent gains in prices. On the other hand, veteran market analyst Ned Schmidt, who also remarks that "current markets for precious metals are more like simple market exhaustion from an overly exuberant run," does advise that "while gold is the only financial insurance to protect an investor from the ostrich mentality in Washington, we still should recognize the obvious trends in the market. Gold, like silver, is in a bear market. Investors should only buy gold when deeply oversold, not when the small children at hedge funds are playing in the futures market." 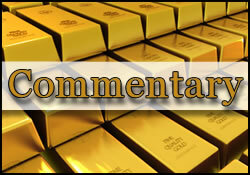 Mr. Schmidt, in his latest "Gold Thoughts" places the odds of bear markets in gold and in silver at 70 and 99 percent, respectively with cycle lows that might occur in either April of August (in gold’s case). PS- I was extremely saddened by the news of the untimely passing of a friend to us all, Mr. David Coffin. On the many occasions that I had to share ideas with him at various industry events, I found him to be a consummate professional, a very knowledgeable source of true facts and figures, and above all, a kind and gentle man, and a welcome breath of fresh air in an otherwise testosterone-laden boisterous group that sometimes unfortunately places hype above integrity. David, you will be sorely missed.